Last night was our big annual Halloween party, which went pretty late. Pictures later. Zzzzzzzzzzzzzzzzzzzzz. Update: Slightly more awake. 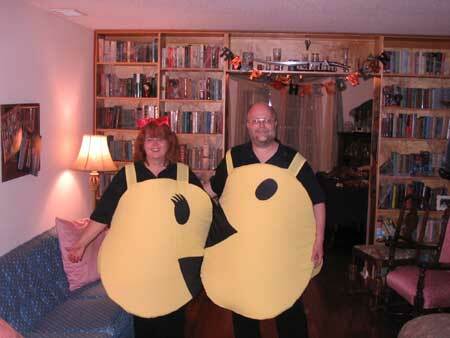 The theme this year was the 80's, so obviousl, we came as PacMan & Ms. PacMan. What do Giuliani’s Religious Right detractors really fear he will do about abortion? If he can overcome their suspicions, secure the GOP nomination, and win the White House, do Giuliani’s critics actually believe he would squander that victory and enrage the GOP base by pushing abortion? Do his foes honestly think Giuliani would request federal abortion funding in violation of the Hyde Amendment he says he supports or appoint activist Supreme Court justices, rather than Antonin Scalia- and Clarence Thomas-style constitutionalists, as he says he would? Having kept or exceeded his mayoral promises on taxes, spending, crime, welfare, and quality of life, why would he break his presidential promises on such a signature GOP issue? What kind of bait and switch do Giuliani’s foes truly worry he will attempt? The contrast between Giuliani and Democratic frontrunner Hillary Clinton, meanwhile, could not be sharper. She would appoint pro-abortion justices and lower-court judges. These jurists also would be softer on crime, racial preferences, unions, and eminent-domain abuse than Giuliani’s would be. Hillary Clinton also would take President Bush’s embryonic stem-cell program and expand it in every direction. If Giuliani does not padlock it, he at least would be more sympathetic than Clinton to privatizing it. If America must banish embryos to Petri dishes, let Lilly, Merck, and Pfizer do this. It is inconceivable that Hillary Clinton would shift anything from Washington to the private sector, especially America’s “greedy, wicked” pharmaceutical companies. As any parent knows, every day is a series of negotiations and compromises, bargains and rewards. You have to maintain authority, but authority without the sense of justice breeds resentment; they have to know your reasons, they have to internalize your logic. You cannot be arbitrary. Likewise, you cannot be weak. Usually when we enter negotiations, and she makes a counteroffer – four grapes, not five – I shrug up the states to six grapes, and thus are five grapes consumed. But once you’ve established a reputation for an iron will, you can bend the rules in situations when no bending was requested, just to let them know you’re reasonable. If the rule is, say, a dish of ice cream on Friday night for a perfect spelling test, then every so often you scoop up dish for a less-than-perfect test, because she got a hard word right. You don’t want fear; you don’t want slavish robotic response; you want to hand down an idea that’s immutable in its purest form, and mutable when mercy intercedes. And hope you’re not teaching them how to work the system. I hope we're both around in ten years when Gnat wants to borrow the car.